My mom has always loved to go see authors, and started taking me with her when I was really young. Sometimes the line was too long (like for Mary Higgins Clark), and my dad would have to come pick me up. When I was 12 or 13, she took me on a road trip to That Little Bookstore in Blytheville. 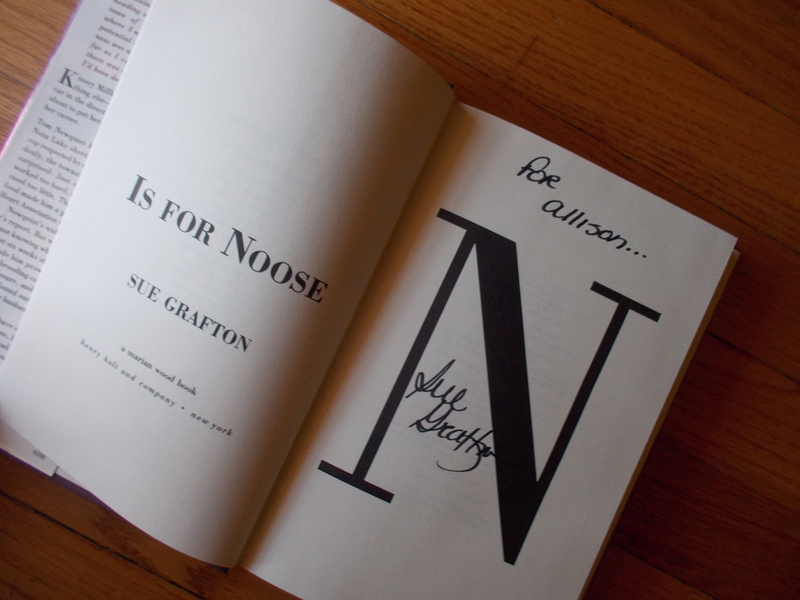 Sue Grafton was going to be signing her newest book, N is for Noose. My mom had read Grafton’s books since the very beginning, but I had never read an adult mystery before. I loved kids’ mysteries, like Encyclopedia Brown, the Boxcar Children, and From the Mixed-up Files of Mrs. Basil E. Frankweiler. I also read adult books – mostly just novels that caught my eye at the library. But adult mysteries just didn’t seem to interest me. After meeting Grafton, Mom encouraged me to start at the beginning of the alphabet. I did, and loved the series. Kinsey Millhone was what I wanted to be when I grew up. I loved the simple, straight-forward style of the writing. I loved that you could actually start anywhere in the alphabet and know what was going on; each book could stand alone. I kept reading each book as it came out, including Kinsey and Me, which is actually one of my favorites. When news broke of Grafton’s death, I texted Mom immediately. We were both sad to hear it. Mom is especially sad that the series will never be finished; she’s invested a lot of years into it! I’ve read them all also, but don’t feel as personally invested. I kind of like that the alphabet ends at Y, that the series will never really end. Because even if Z was written and published, I would hate to read it and have to say goodbye to Kinsey Millhone. Sad to say, I have yet to read any of Grafton's books, and since the news of her passing, I'm even more anxious to start at A. Soon, I hope. It's lovely that you got to meet her and have that signed book as a memento of the occasion. Hope you're having a wonderful A-Z, Allison! I think you'll like the series - it's so easy to get into, and all of the cases are believable so it doesn't take you out of the story like some over-the-top mysteries/suspense novels.